Meadowbrook Healthcare is proud to have an unparalleled food service program. Our culinary team comprised of Registered Dieticians, Dietary Technicians, and our Chef who has over 20 years of experience in food service. Our menu changes four times each year and features homemade soups, entrees and desserts appropriate for each season. 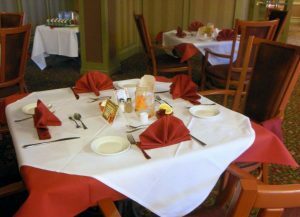 The changing selections of healthy and pleasing menus options are enjoyed by our residents and patients. The menu plans are carefully monitored by our Dieticians and other medical professionals. For special events, our Chef creates a menu that compliments the activity. During our Annual Thanksgiving Celebration, residents enjoy a traditional holiday feast and quality time with their families. At Meadowbrook we understand that great food is at the heart of many of life’s important celebrations. Hot, fresh meals are served from steam tables on the resident household neighborhoods at set times every day. Residents may choose to dine in their rooms or in the lounge with friends. For a reasonable fee, family and friends wishing to dine with their loved ones may order guest trays.